The HDS washers have been specifically developed for high-strength bolts in the strength classes 8.8 –10.9 as per DIN ISO 898 Part 1 (SAE Grade 5). The loads of the washers have been matched to these bolts and are 70 to 90% of the bolt load in the flat state. These high loads naturally require large cross-sections, which is why the outside diameter of the load washer is considerably larger than that of the Schnorr serrated safety washer. As a result, the area required for a design with load washers cannot be ignored. 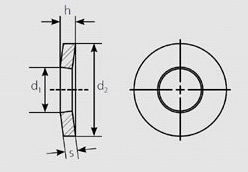 As a highly progressive load increase occurs at the end of the spring deflection when the washer is flattened, the load has been indicated as double the calculated value in the following table. Tests are shown that these values are comparable with the measured values. The HDS washers contained in the table conform to DIN 6796, Edition October 1987 ‘Conical spring washers for bolted connections’. The test specifications are laid down in DIN 267 Part 26 ‘Fasteners; technical specifications for elements made of spring steel for bolted connections’. Hardened, blank and oiled; mechanically galvanized; other materials on request. Load washers according to DIN 6796 in different finish and material are available on request.